With the release of the iOS app Voico, it is time that we change the way we communicate worldwide. As the name suggests, this app brings together the best of voice and video apps in terms of technology. The audio and video calls come with high definition and the best quality of communication that you can find. This applies all across the globe, even in places without good internet connectivity. If you wish to connect with family and friends spread across the globe, you must look at the Voico app for sure. The good thing about this app is that any smart phone or smart device can run it. All you need is an iPod Touch, iPad or iPhone with iOS 7.0 or higher versions. The services can be used through a Wi-Fi, LTE, 3G or 4G connection without any inconvenience. With this app, you can share everything from locations to messages to videos to photos to make video and audio calls- all with the best quality communication available in the market today. 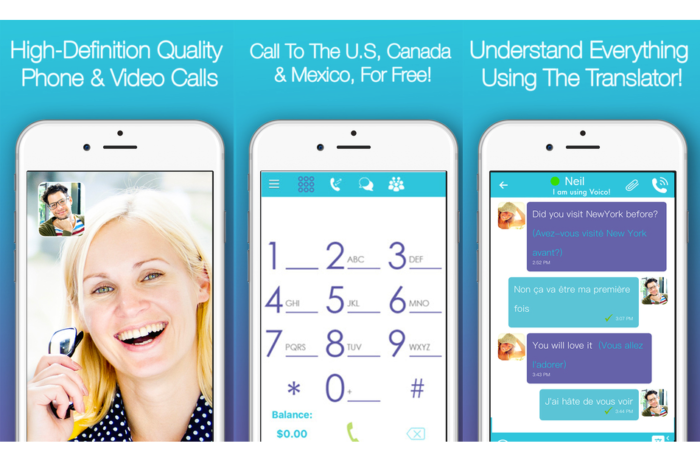 If you are living in Mexico, Canada or the USA, Voico has some great news for you. The Voico out feature will allow you to make free calls to mobile numbers and landline numbers in these 3 regions. The call will be received directly by the recipient. In case you are not from one of these countries, fret not. Voico has you covered too. The app offers very low international calling rates for other countries too. This makes it the app of choice for most users. Voico has a special feature that makes it a truly international app- real time text translator to allow people to communicate irrespective of the language barrier. This feature is available for free on the app and gives users a choice between 101 languages. You can also send messages in other languages to users across the world. The app does a lot of magic in between. You can send a text in English and have it received in Spanish at the other end. This is extremely useful for businessmen with international clients. You can now communicate with them without the need for a separate translator. This feature makes the app truly international and helps it stand out. Another superb and innovative feature offered by Voico is Voico virtual phone numbers. This feature can be used to save on your phone bills. Users can create virtual phone numbers through the app with rates as low as $10/month. The main advantage of this is that you can pick a local phone number from over 50 countries. When you make calls to family and friends in those countries, only the local calling rates will apply. This saves you the huge cost involved with making international calls. Voico is an iOS app that helps bridge the gap between people across the world. It is working towards making the world a smaller and more international place. Distance or low internet connectivity must not act as a barrier for communication with loved ones. Voico is an app that you must try out if you make a lot of international calls or wish to make high definition video or audio calls. Voico is an app that you must try out if you make a lot of international calls or wish to make high definition video or audio calls.